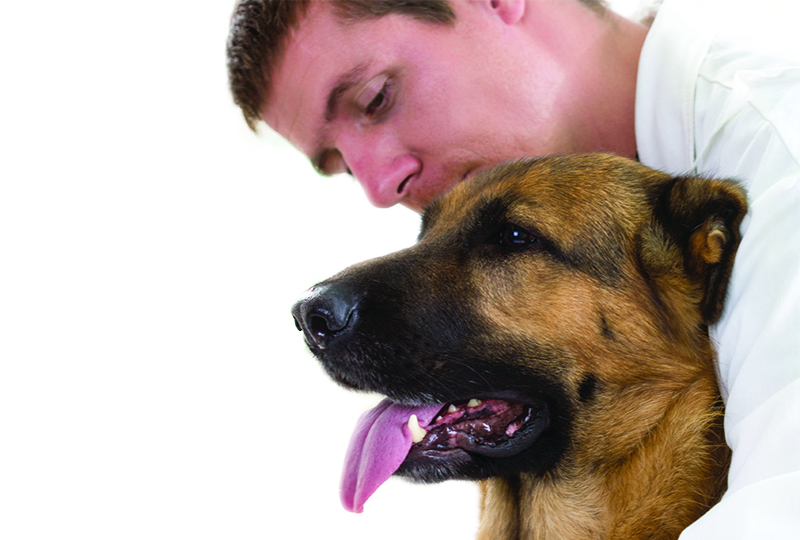 Welcome to Endoscopy Essentials—one of the newer columns in Today’s Veterinary Practice. Similar to our Imaging Essentials column, which addresses radiography by anatomic location, each article in this column discusses endoscopic evaluation of a specific body system, reviewing indications, disease abnormalities, and proper endoscopic technique. The Endoscopy Essentials articles are archived at tvpjournal.com. Endoscopy is a minimally invasive tool that can be used to aid in the treatment of common small animal gastrointestinal (GI) diseases. Esophageal and gastric foreign bodies are commonly encountered in small animal practice. Endoscopy is the treatment of choice for esophageal and gastric foreign bodies, as it can be used to remove a variety of foreign objects with little risk to the patient. When compared with surgery, endoscopy offers clients a less invasive and less expensive option. The presentation of a pet with a GI foreign body varies depending on location, size, and configuration of the object as well as the degree of obstruction. 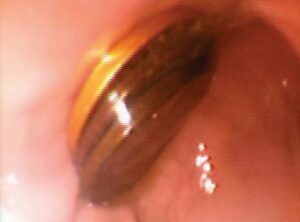 Many patients with esophageal foreign bodies have a peracute presentation, although a chronic presentation is possible with partial obstruction. A patient with a freely movable gastric foreign body might present with intermittent vomiting, whereas a large or obstructive foreign body is more likely to cause frequent vomiting, poor appetite, and abdominal pain. 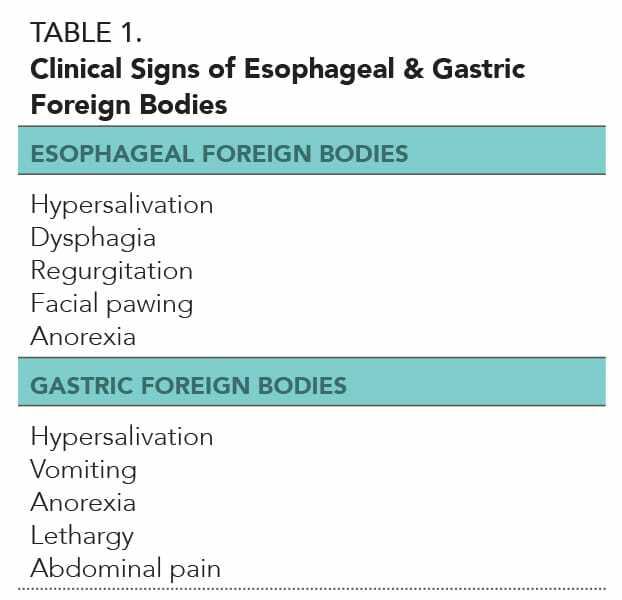 Clinical signs of esophageal and gastric foreign bodies are listed in Table 1. However, clinical signs tend to be variable and may seem incongruous with the foreign body. Patient presents with fever or signs of shock indicative of luminal perforation (ie, esophageal, gastric, intestinal). 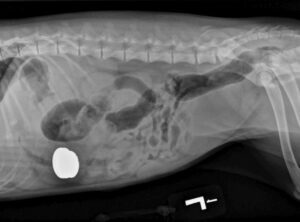 Remember that not all commonly ingested foreign objects are radiopaque (eg, plastic, wood). FIGURE 1. 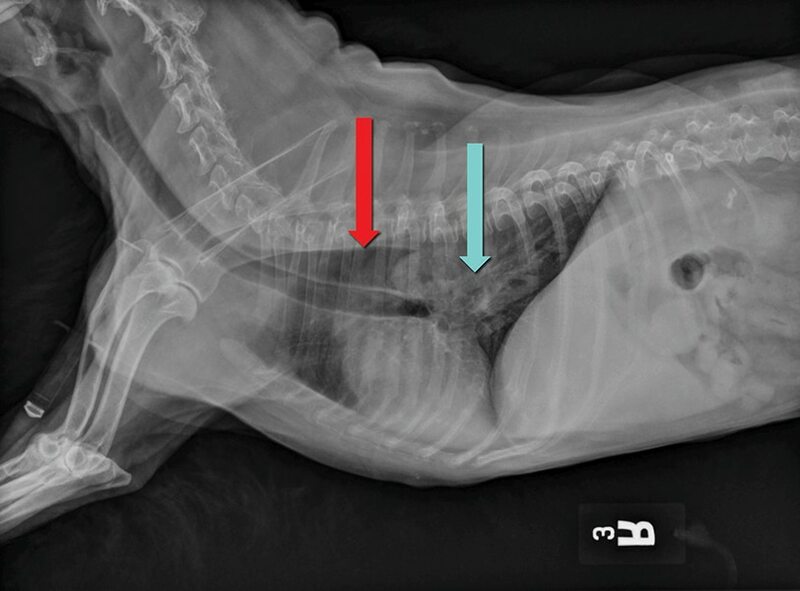 Lateral thoracic radiograph of an esophageal foreign body (blue arrow) in a dog; note the esophageal dilation proximal to the foreign body (red arrow). In practices with an ultrasound machine and an experienced ultrasonographer (ideally board certified), this imaging modality can be used—as an initial diagnostic study or adjunct to radiography—to evaluate patients for nonesophageal GI foreign bodies. Ultrasound has been shown to have a higher sensitivity than radiographs for identification of GI foreign material,1 but is a more expensive, user-dependent modality that may not be readily available on an emergency basis. In addition, gastric ultrasound can be challenging when food and/or gas, which can obscure the view of potential foreign material, is present. Further, it may be difficult to determine whether the material present is normal ingesta or a foreign body. However, additional benefits of ultrasonography include identification of abdominal lymphadenopathy, peritoneal fluid, and abnormal intestinal wall layering. 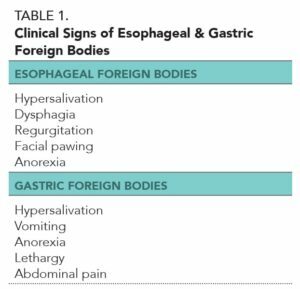 If a gastric foreign body is still suspected despite normal radiography and ultrasonography studies, alternative imaging studies can be considered. Negative contrast gastrograms highlight radiolucent foreign bodies, while positive contrast agents, such as barium, outline radiopaque objects in the stomach (Figure 2). Figure 2. 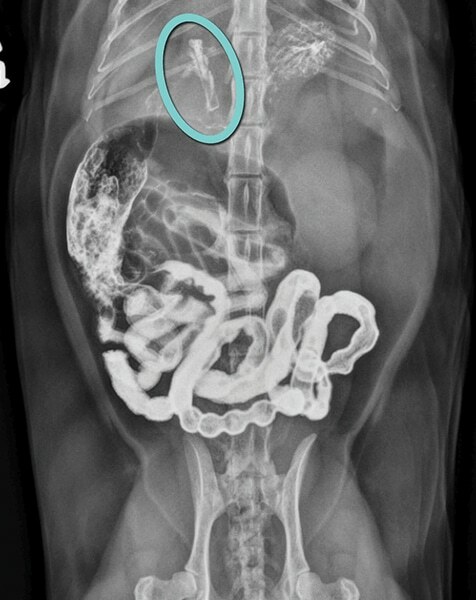 Ventrodorsal view of a barium study in a cat; the barium highlights a tubular foreign body (circled) in the stomach. Many foreign objects pass through the GI tract with little consequence; however, knowing which objects will take a benign course is difficult. Therefore, recommending a conservative “wait and see” approach is best reserved for pets that do not have significant clinical signs and have ingested small, round, or blunt foreign objects. Objects that have been retained for more than 2 to 3 weeks. Objects that are very difficult or impossible to remove from the stomach endoscopically include corn cobs, large rocks, large balls, polyurethane glue, and heavy objects. Figure 3. Lateral abdominal radiograph of gastric foreign bodies; multiple stacked coins can be seen in the antrum of the stomach. Table 2 provides a complete list of commonly used foreign body retrieval instruments. Note that retrieval forceps may be limited by the size of the working channel; large instruments require a 2.8-mm working channel. Do not use biopsy forceps because the foreign body may damage or blunt the instrument. 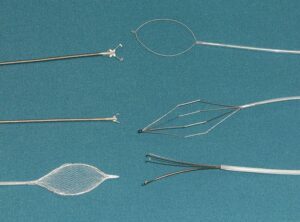 Disposable instruments are available, but they are less sturdy and durable. Figure 4. 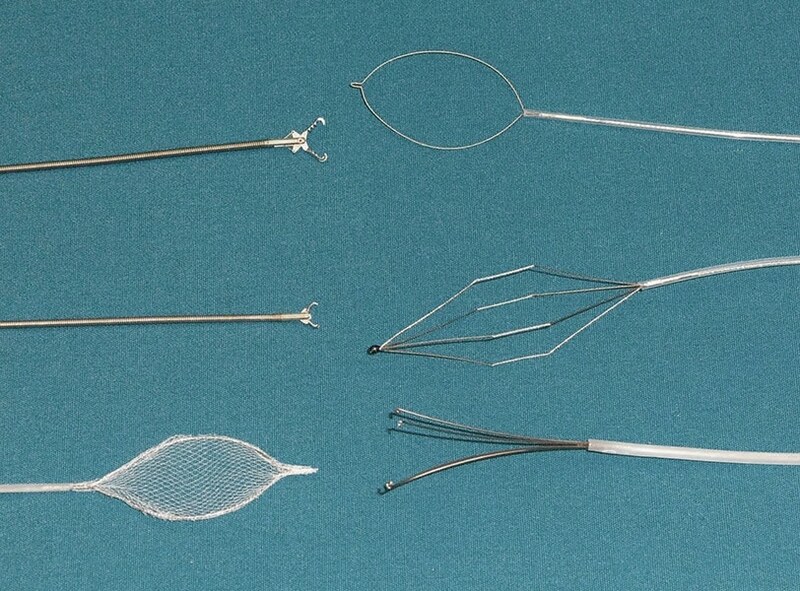 Foreign body retrieval instruments (clockwise from top left): raptor forceps, snare loop, basket grasping forceps, 4-prong grasping forceps, Roth net retriever (usendoscopy.com), and rat tooth forceps. When a foreign body is sharp, or concern exists that mucosa could be damaged during extraction, an overtube or hood can be used (Table 2). Overtubes are designed to pass over the endoscope; they should be 2 mm larger than the endoscope and 50 to 60 cm in length. Foreign body hoods are rubber latex shields that fit over the distal aspect of most gastroscopes. Perform routine preanesthetic blood analysis and complete physical examination to evaluate systemic health, and tailor the anesthetic plan, when possible. Discuss risks and possible complications with the client. Ensuring the endotracheal tube cuff is well inflated. Distend the esophageal lumen with air to obtain good visualization, and designate an assistant to monitor the degree of gastric distension. Acute respiratory decompensation can result from insufflation into a perforated esophagus or severe overdistension. 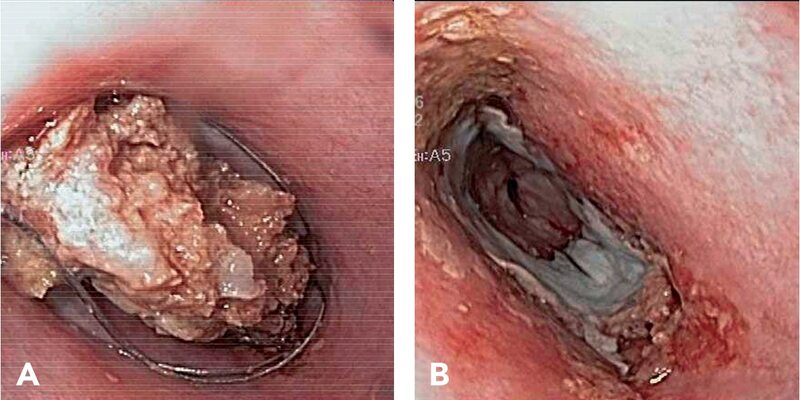 Is the object embedded in the esophageal mucosa? Are there ridges or grooves that can be grasped easily? Is the position amenable to extraction? Are there sharp edges that could damage the mucosa during extraction? Select a retrieval instrument based on the appearance of the foreign body and grasp the object firmly, seating the retrieval instrument onto the object as much as possible. Withdraw the instrument to the tip of the endoscope; then remove the object and scope together, slowly and with minimal force. If the object needs to be adjusted to facilitate grasping it, avoid using the endoscope, which can damage its tip. Instead, use an overtube to push or manipulate the object. Object gets caught at the UES, endotracheal cuff deflation may facilitate extraction. The majority of esophageal foreign bodies can be removed quickly and without complication. However, when objects cannot be retrieved easily, the following techniques can be considered. Inflate the cuff, and gently and slowly withdraw the catheter. Techniques for Sharp Objects. If foreign bodies are sharp or have become embedded in the esophageal mucosa, the object must first be dislodged before grasping and removing it, which can be particularly challenging. Techniques that may facilitate removal include full air distension of the esophagus, balloon dilation of the esophagus proximal to the object, and short interchangeable push and pull movements. If the object is stuck within the esophagus and in reach of a rigid grasping forceps, attempt removal with a gentle twisting motion. Do not use this technique with fishhooks. Dislodge fishhooks from the esophageal mucosa by grasping the stem and deflecting the tip of the endoscope away from the wall (Figure 5). Ensure that the fishhook’s point is directed caudally, whenever possible, during extraction. Figure 5. Endoscopic image of a fishhook esophageal foreign body in a dog. The object cannot be pushed into the stomach for removal via laparotomy. Gastrotomy. If the object is distal in the esophagus, it may be possible to perform a laparotomy to remove the object via a gastrotomy. If perforation is suspected, obtain follow-up thoracic radiographs. Ensure that no additional foreign objects are present. Evaluate the mucosal surface thoroughly for damage (Figure 6). Chronic mucosal injury may weaken the esophageal wall, increasing the risk for iatrogenic tearing during foreign body extraction. Consider treatment of esophagitis (see Treatment of Esophagitis & Severe Esophageal Injuries) when the mucosa appears erythematous, eroded, or ulcerated. Offer soft food to the patient for 18 to 24 hours after the procedure. Note that exuberant post-procedure healing may lead to esophageal stricture. Figure 6. 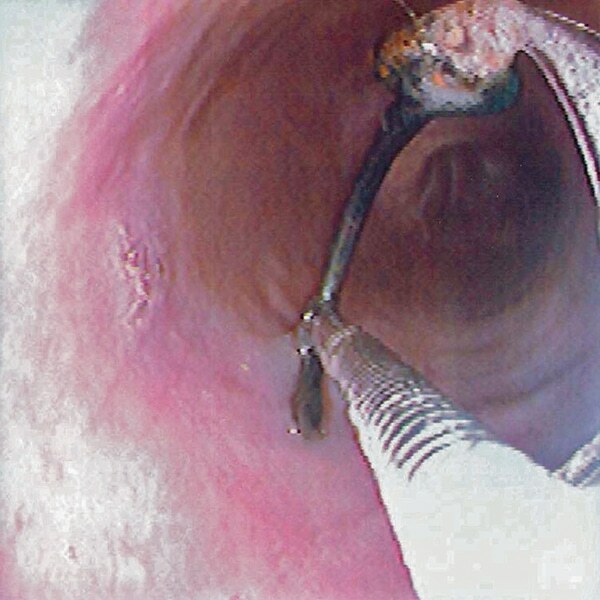 Endoscopic image of a rawhide esophageal foreign body in a dog being removed with a snare retrieval instrument (A); note the esophageal pressure necrosis and mucosal erosion following extraction (B). Corticosteroids: If there is no evidence of infection, a short tapering course of prednisone may reduce the fibroblastic response, decreasing risk for stricture formation. With severe esophageal injury, consider placement of a gastric tube to allow esophageal rest while providing adequate nutrition. For more information on medical therapy for the GI tract, read Symptomatic Management of Primary Acute Gastroenteritis. Alternatively, rotate the patient to right lateral or ventral recumbency during the procedure, which can also aid in locating the foreign body or making it more accessible. Review all radiographs taken within the previous hour and examine the entire length of the GI tract for evidence of additional foreign bodies, noting the number and general location of the objects. Timeliness of radiography is crucial because, if gastric motility is normal, an object may move from the stomach into the small intestine between the time of the last radiograph and the procedure. Therefore, a common, but avoidable, mistake during endoscopy is failure to locate a foreign body in the stomach because it has moved into the small intestine. Remember that endoscopic retrieval can only be reliably employed for objects in the esophagus and stomach; it is imperative to ensure there are no objects within the intestinal tract. Follow steps 1 and 2 from Esophageal Foreign Body Retrieval: Endoscopic Retrieval. Once the object has been found and characterized, select an instrument and advance it into the working channel. Grasp the object firmly, then withdraw it to the endoscope tip, attempting to create favorable alignment between the object and endoscope to minimize resistance and facilitate smooth extraction through the LES and UES. Retract the endoscope and object as a unit, slowly and without force. Using an overtube to help distend the LES enough for the object to pass through. Leaving an overtube in the stomach to facilitate more rapid removal of numerous foreign bodies because the operator can quickly slide the endoscope in and out of the patient. If the object is circular (eg, a prong collar) and difficult to grasp, a suture technique may be helpful. This technique results in placement of a loop of suture through the foreign body, allowing the operator to remove the object by pulling both ends of the suture with gentle traction. Retract the grasping forceps through the working channel of the endoscope to grasp one end of a monofilament suture, while holding the free end of the suture outside the patient. Advance the forceps back into the tip of the endoscope and then the endoscope to the foreign body. Once at the desired location, advance the suture around or through the object and release it; then re-grasp the suture on the other side of the object and withdraw the endoscope. Once an object is removed, inspect the stomach thoroughly for mucosal disease or additional foreign material. If the foreign body is chronic (suggestive of a motility disorder) or chronic GI disease precipitating ingestion of the foreign body is suspected, perform a complete upper GI endoscopy (see Upper Gastrointestinal Endoscopy Series—Part 1: Overview of Upper Gastrointestinal Endoscopy, November/December 2014, and Part 2: Upper Gastrointestinal Endoscopy Techniques, March/April 2015, available at tvpjournal.com). Follow-up treatment is not usually required and the patient may be offered food 8 to 12 hours after the procedure. Treat patients with visible erosions or ulcerations as outlined earlier for esophagitis. Tyrrell D, Beck C. Survey of the use of radiography versus ultrasonography in the investigation of gastrointestinal foreign bodies. Vet Radiol Ultrasound 2006; 47(4):404-408. Gualtieri M. Interventional endoscopy. In Washabau R, Day M (eds): Canine & Feline Gastroenterology. St. Louis: Elsevier, 2013, pp 304-307. Guilford GW. Upper gastrointestinal endoscopy. In McCarthy TC (ed): Veterinary Endoscopy for the Small Animal Practitioner. St. Louis: Elsevier, 2005, pp 312-317. Tams TR, Spector DJ. Endoscopic removal of gastrointestinal foreign bodies. In Tams TR, Rawlings CA (eds): Small Animal Endoscopy, 3rd ed. St. Louis: Mosby, 2011, pp 245-263. Julie Callahan Clark, DVM, Diplomate ACVIM, is a staff internist in small animal internal medicine at University of Pennsylvania School of Veterinary Medicine. She received her DVM from Tufts University and completed an internship at New England Animal Medical Center in West Bridgewater, Massachusetts, and a residency in internal medicine at University of Pennsylvania.